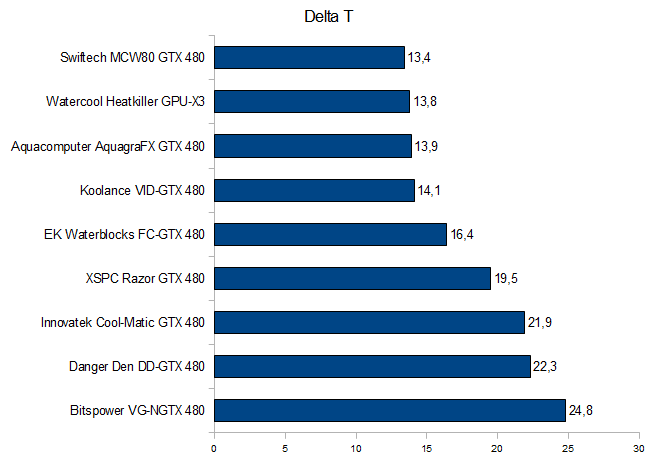 [Review] 9x GTX480 Waterblocks tested ! today, I want to give you an overview of the currently available waterblocks for the NVidia GTX 480. I had nine different blocks around for testing. While high performance CPUs are using less and less power, this is a trend that can't be seen when looking at high end VGA-cards and so fullcover blocks are getting more and more interesting for users of NVidia's and AMD's flagships. In this roundup I want to compare temperatures and flow rates of the blocks. As the NVidia GTX480 does already come with high heat build-up as standard and is able to use radiators to full capacity, I disclaimed overclocking in this review. Firs t of all I want to say that every block was able to cool the card appropriately and quietly. When choosing the block that's good for you, you shouldn't only look at the top ranks in this roundup, but take a look at the complete package: looks, build quality, price, temperatures, mounting and flow rates. As it turns out, blocks with microfin-structure were able to perform best once again and so it comes as no surprise that the blocks, that are pretty much the same inside are very close together at the top. The included backplate with some of the models proved useful, as it's mounted on the back of the card for more contact pressure, especially in the area of the mosfets. Also, this plate can help to prevent damage to the card. ArctiClean for cleaning the card and the blocks. My special thanks go out to the company EVGA for offering me the required GTX480 VGA-card! To fully load the card, I used Furmark v.1.8.2 (settings: 1280*1024, 8x MSAA). As mentioned before, the card ran at stock speeds. I used Gelid Xtreme for this test. Every block was mounted three times with new thermal paste and the best run of all three was used for the end results. As the Geforce GTX480 doesn't come with sensors to monitor the temperatures of the mosfets, I used the relevant temperature of the GPU, that I monitored using GPU-Z. The water temperaute was monitored using an Aquaero and several calibrated (inline) sensors. The reading was taken when no change in temperature was visible and the maximum value was reached, but not before one hour has passed. 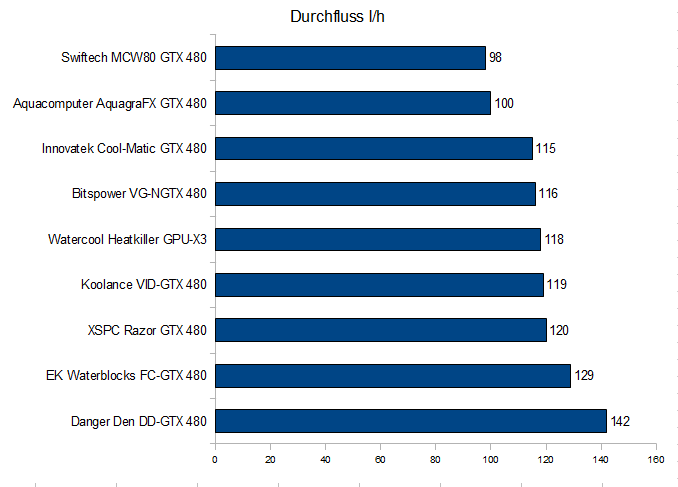 For years, the waterblocks by Watercool.de were able to score big in a lot of reviews worldwide. 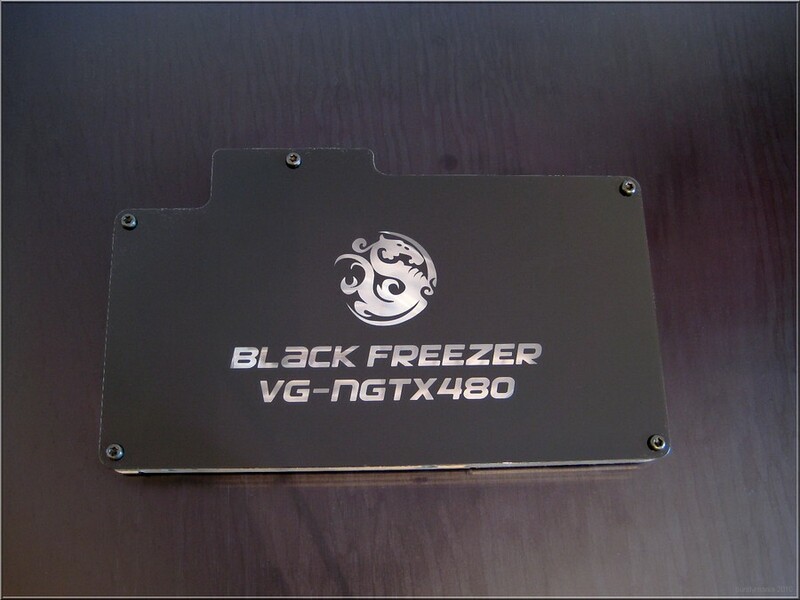 The block for the GTX480 was also able to do the same. 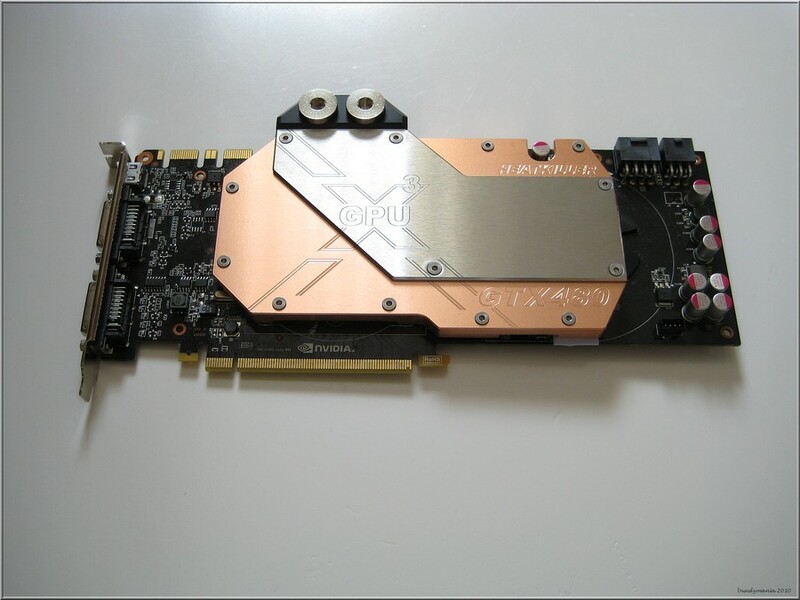 Outstanding build quality, delicate looks and of course the impressive temperatures, reached by the means of good design and so-called microfins directly above the GPU. Watercool made a block that's very thin, taking a step away from the modular style of older blocks, which were very popular because of their upgradeability. 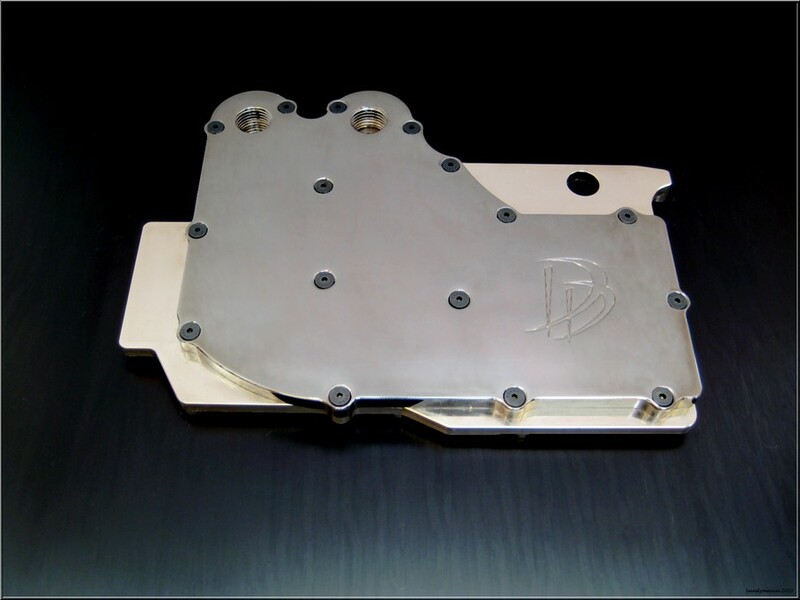 The waterblock looks a lot more like the products of another German manufacturer, a very basic design and a thin corpus made out of copper, paired with a stainless steel plate carrying the name of the new cooler series. Mounting this block was easy and quickly done. This block also convinced me when it came to performance. With an adaptor which is sold separately, you can also use up to four waterblocks of this kind in SLI. The scope of delivery can also be called good: the box contained the required mounting material and an easy to understand manual, thermal paste is not included. Paste is used on the GPU only, the other cooled parts are connected via thermal pads, which come pre-cut, which is time-saving. The block fits the card very well, for good contact pressure in the area of the mosfets there's a mini-backplate, used on the back of the card. The second block out of Germany is this product by Aquacomputer.de. I received the nickel plated version for this review, only differing from the standard version in its surface and its price, as it's a little more expensive. This block makes a very solid impression and looks pretty good. It's milled out of one copper block and topped by stainless steel carrying the manufacturer's emblem. The inner design is similar to the one seen on the block by Watercool, so it's not surprising that this block performs just as well. The scope of delivery includes a manual and the required mounting material, but once again, thermal paste isn't included. As a little bonus, a backplate out of stainless steel for creating better contact pressure and avoiding bending the card is also included. This works well, so well, that you don't have any doubts when using thermal paste instead of pads on the memory. There's also an adapter available for using up to seven cards in SLI with this block. The mounting is simple, only when putting the backplate in place you have to be patient. You have to be extra careful not the move the backplate when putting the spacers in place. Overall, this block by Aquacomputer knows how to impress, especially in this nickel plated version! Let's get to the block of the Slovenian manufacturer EK-Waterblocks. This block is, as usual for EK-WB, available in several versions: There are variants with tops in black POM and acrylic glass and the cooling surface itself is available in copper or nickel. 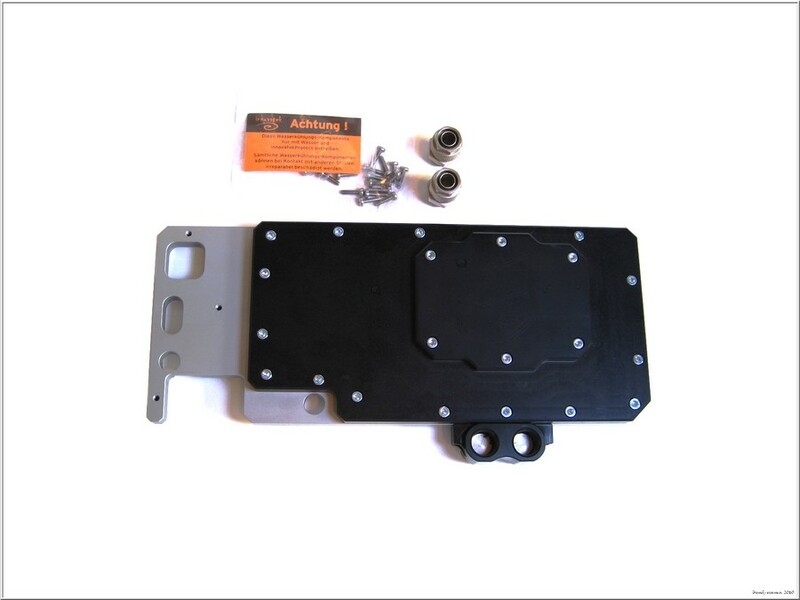 A backplate isn't included and is available for around 20€ in two different versions. Adapters for using several cards in SLI are also available. Let's get back to the block itself. It comes in a nice orange/black retail box with a manual. This box also includes the required mounting material; thermal paste is only used on the GPU itself, thermal pads for the other components are also included, which have to be cut. 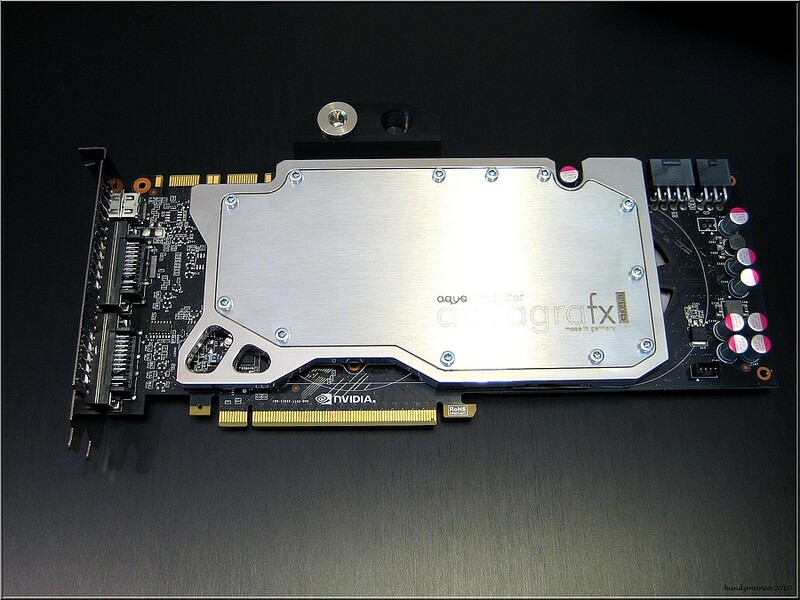 The EK-FC480 GTX in this nickel plated version impresses in performance and build quality, but it's not easy to install it on the card. The spacers have to be glued to the block using thermal paste - this could be done another way, just like other manufacturers do it. Mounting the card in the area of the mosfets didn't work that well without the backplate which is sold separately, you really have to check the pressure. Overall, the EK block is a good product that scores a lot because of the high amount of variants. The English company XSPC produces this block. 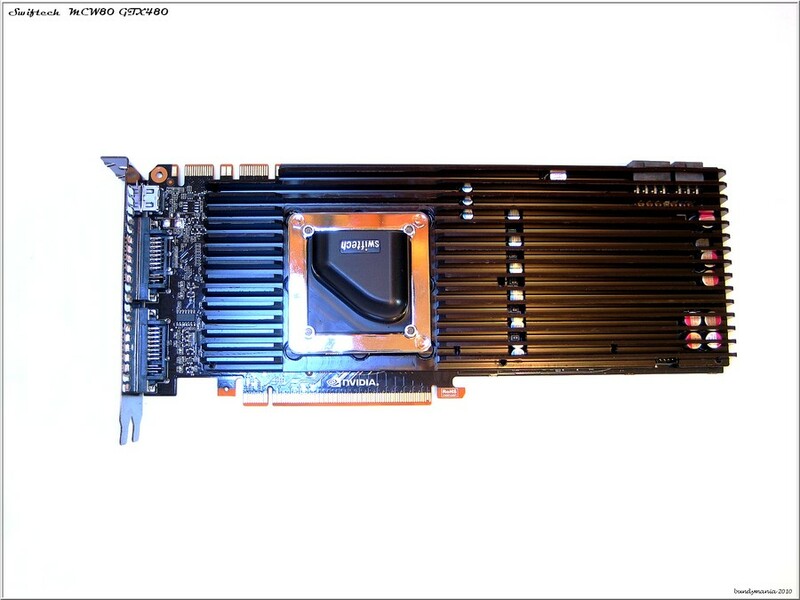 The very slim block is called XSPC Razor GTX480 and is the cheapest block in this review. The performance is good, though not as good as some other blocks. Mounting was easy and the scope of delivery can be called "complete". The required thermal paste was also included, unlike with most of the other blocks. This block uses thermal paste on the GPU and pads, which come already pre-cut, on the memory, too. Conveniently, the spacers are part of the block and so no complicated mounting is required. Sadly, a backplate doesn't come with the block, but even without one, the block was mounted quite easily with the correct contact pressure. 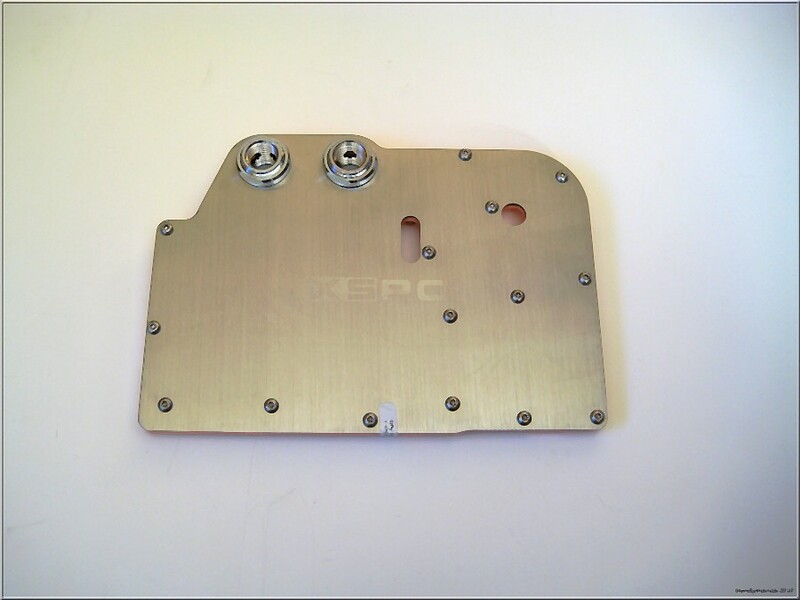 This XSPC block is well made out of copper with a top out of stainless steel and is also compatible with SLI-systems. Because this block is very thin (only 9mm! ), the threads are screwed on and not part of the block itself. Spacers might be required, but are included. On one side, there's a sticker for the warranty, slightly disturbing the look. 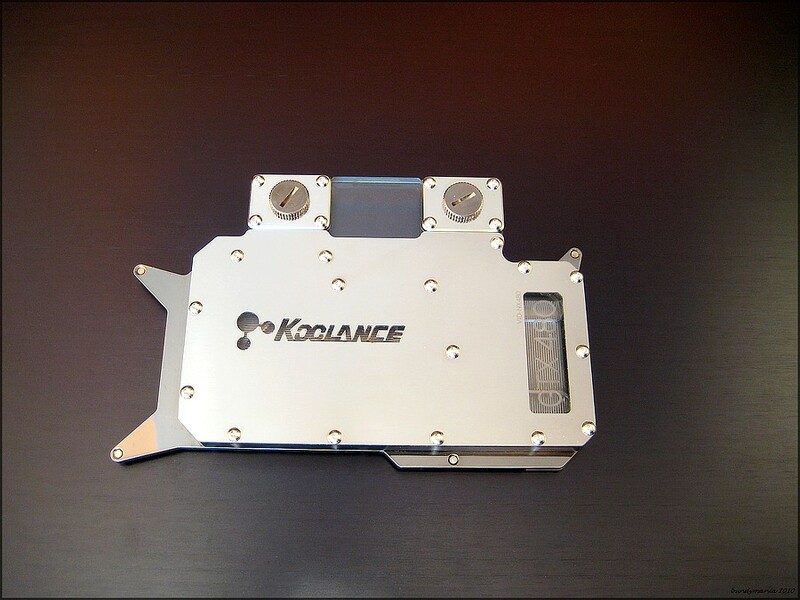 Koolance have been around for more than ten years in the watercooling scene and have produces quite a lot of successful products. That's why they also came up with a block for the GTX480, called the VID-NX480. Robust, massive, impressive - these words came into my mind when unpacking. The block is shipped in a black retail box with a rich scope of delivery. The bottom plate is made out of black nickel plated copper and in the middle, there's acrylic glass, that's lit by two 3mm blue LEDs. Useful: These LEDs get their power via the 4-pin fan-power on the VGA card. There are also other colors available at the Koolance store at an additional charge. The top is made out of stainless steel, carrying the company emblem which offers some insight in the inside of the block. Because the fittings are very far apart, you can easily use every sort of fitting on this block, even though some fittings might require spacers. Of course this block is also SLI-compatible, adapters are sold by Koolance or 3rd-party-companies. This block also comes with two large thermal pads that the users has to cut to use them, giving more than enough material for another installation. Just like every block, I also disassembled this Koolance block after testing and fount out, that the Koolance-guys more than the required amount of grease in this block, leaving easily visible traces of it in the block and the system. I spoke to Koolance about this issue and they stated that the newer blocks made since the end of July 2010 contained less grease, so that this problem shouldn't exist anymore. Overall, this still is a great block, offering very good performance and great build quality. Only the rather expensive price in Europe and the grease weren't that great. Now, I'd like to present the block by Bitspower, carrying the Name VG-NGTX480 and it's available in six versions. The amount of variants is nice, but they only differ in the colors of the top and the LEDs. The middle is made out of acrylic glass, while the bottom is black nickel plated copper. The block is very massive and makes a good impression. The scope of delivery is complete: Everything needed for mounting and usage is included in the black retail box, even high quality thermal paste, a replacement o-ring and two twistable adapters for the two G1/4"-fittings. In contrast to all the other blocks in this review, the threads are on the front of the block, making these adapters especially useful in small cases to avoid crashing into the side. The installation itself is pretty easy because of long spacers screwed into the block and small screws on the back of the card. The mentioned middle part can be lit and the top can be removed for other looks. For this review, I received the block with a black top, visible in the large picture. This block fits my card very well and the contact pressure is good, but the high price of almost 150 EUR and the achieved performance couldn't convince me. Of course the GPU temperature of the GTX480 was 30° less than with the stock cooling, but still this block couldn't score well. The block's design is missing the microfins and a backplate, also extra screws in the area of the mosfets. The American company Danger Den is one of the established manufacturers in the watercooling business and shiny acrylic cases. They also offer a fitting block for the GTX480, that I've got here for testing. This block is also sold in different versions with different surfaces and therefore also prices. There's for example a copper version and another one with a nickel plated top. For this review, I used the block that's completely nickel plated, but I also ordered a black top for better looks. This block is very heavy with more than 1100g and makes a very solid impression. It fits well and mounting is done very easily using the included manual. In case of problems, you can also have a look at Danger Den's video on YouTube. This block also uses thermal pads for all the components instead of the GPU, for which some thermal paste is included in the white box. Two barbed fittings are also included and can be chosen via the online shop. The block's bottom is made out of copper with channels for cooling as seen in the picture above. The area around the GPU is very wide, explaining the low resistance to water. A microfin structure would have improved the performance, though. A backplate for this block isn't available. 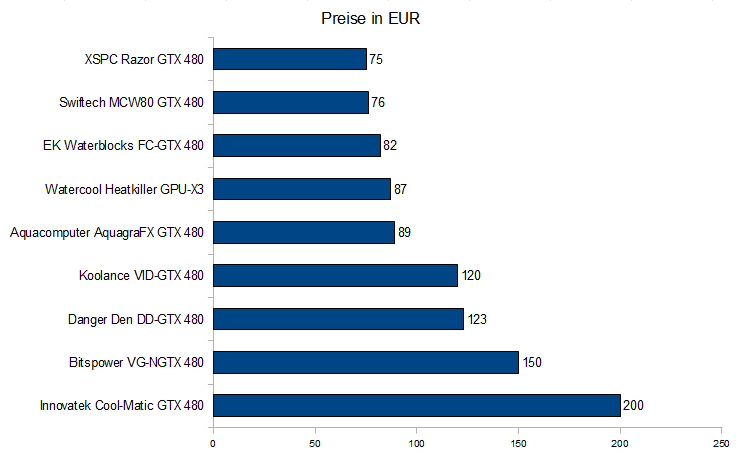 When having a look at other manufacturers, it took a rather long while for the Bavarian company Innovatek to come up with their block for the GTX480. Of course, I want to show you how this 200€ - expensive block performs. The build quality is, as known from Innovatek, flawless and comes with a very complicated cooling structure. 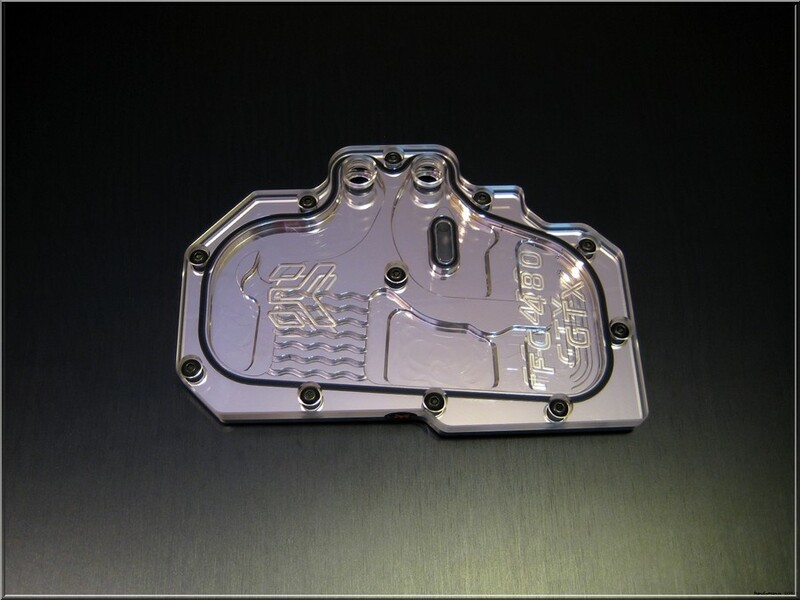 In the GPU-area, they chose a nickel plated copper bottom plate with a fitting microstructure jet element, which is screwed onto the bottom plate and is supposed to offer good performance. Because of this structure, you have to be careful not to mix up the in- and the outlet - the manual in three languages helps not to. The block itself comes in a white retail box containing the block, the required mounting material and a rather short, but illustrated manual. It also contains some thermal paste, which is probably supposed to go on all the cooled parts - the manual doesn't cover this at all. Because of its length, this block is very heavy, but still sits well on the card without bending it; even without a backplate it comes with the required contact pressure. The scope of delivery also includes two screw-on-fittings for 10/8-tubing. The Cool-Matic GTX 480 is SLI-compatible with its four threads for fittings, but not all fittings will fit here because they're very close together. This review's odd man out is this block made by the American company Swiftech. They use passive cooling for most of the parts, while only the GPU itself is cooled by the water, which is also available standalone to use with other components on other VGA cards. This block costs around 100 US$ and comes in a white retail box with all that's required for the installation, also including thermal paste. The thermal pads are already cut and stuck to the passive cooling element, so that you only have to remove the protective foil. The manual comes in English, French and Spanish. Two barbed fittings are also included. Optionally, you can also mount a 80mm-fan on the passive element, making the mosfets cool down even more. This is recommended when overclocking, as these parts can only cope with temperatures up to 100°C and already get pretty warm when not overclocking. The block's bottom plate is based on the successful Apogee XT CPU-block, so it's not surprising, that the achievement temperature is the best I've seen yet. Still, because of the very delicate structure, the flow rate does suffer quite a lot. Overall, the build quality is good, even larger screw-on-fittings for 16/10 (5/8") tubing can be used. There's a block for every taste and wallet size in this roundup. As expected, there aren't big differences in the top ranks when it comes to temperatures. Every block in this test is able to cool down the GTX480 a lot better than the stock cooling. You should always look at the whole bundle when buying a block and not only look at these charts. I especially thought the Swiftech block was interesting, even though it probably doesn't appeal to all, just as all of these blocks, especially when looking at the price, the chosen materials or the design. Luckily, the user can choose between several manufacturers and isn't limited to two or three models, like it was a few years ago. Personally, I'd like the companies to make the block easily mountable, the instructions understandable and the scope of delivery complete, for all the users out there. Thermal paste and enough thermal pads are also important for this. Would have been nice to see VRM temperatures, but very good review nonetheless.